When you decide to hit the road, you probably don’t give much thought to the other people who will be driving alongside you. And this makes sense as the overwhelming majority of the people you end up in a lane next to will not have any impact on whether you safely reach your destination. However, you cannot predict who you are going to end up on the road with. And unfortunately, road rage is a part of our society these days. The Miami Herald recently highlighted an example of the consequences of road rage. According to the report, a few weeks ago, a North Miami Beach man became so angry during a road rage incident that he plowed into a man with the front end of his vehicle. Police reported that the force of the impact sent the victim airborne, after which the North Miami man drove over the victim’s head with his back wheel before speeding away. Sadly, the injured victim remains hospitalized with severe brain hemorrhaging, a broken back and skull and face fractures. Supposedly, the road rage incident stemmed from an altercation that began with one car blocking the other and escalated when both men got out of their vehicles. 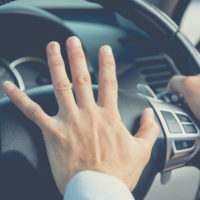 According to the Department of Motor Vehicles, the term “road rage” encompasses any kind of aggressive or violent behavior that stems from a driver’s uncontrolled anger at the actions of another motorist. How Common Are Accidents Caused By Road Rage? By its nature, road rage is difficult to quantify, especially because it typically requires self-identification. But according to a 2016 report published by the American Automobile Association, almost eighty percent of drivers admitted to experiencing significant anger, aggression or road rage behind the wheel. Most alarming, the findings indicate that eight million drivers disclosed that they had engaged in extreme examples of road rage, including purposefully ramming another vehicle or getting out of the car to confront another driver. What Should You Do if Confronted in a Road Rage Situation? And most importantly, remember to stay calm. Have You or a Loved One Been Injured as the Result of Someone Else’s Road Rage? If you were injured in a car accident caused by a driver with road rage, you need help from someone who can explain your legal options and help you hold the responsible parties accountable. The experienced Miami personal injury attorneys at the Pendas Law Firm are experienced in helping people like you recover. Contact us today to schedule a free initial consultation. The Pendas Law Firm also represents clients in the Fort Lauderdale, Orlando, Jacksonville, Daytona and Bradenton areas.